Our potted Dracaena reflexa – ‘Song of India’ that was located at the courtyard was unhappy and breathed its last recently. Ta-da… we happily took home a pot of Calathea roseo picta ‘Dottie’ that cost us only RM15. Its beauty was simply irresistible! 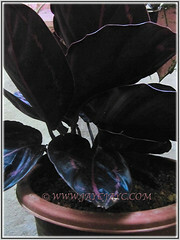 The vivid pink markings on the dark black-green leaves captivated and dazzled us so! Even the new emerging leaf had the distinct bright pink markings. It was mutual love at first sight… we wanted it and it wanted us! Reaching home, I quickly replanted this treasured beauty into a new pot and located it at our courtyard where mostly variegated plants that love semi-shade dwell. Gosh, it really stands out amongst the greens! Botanical Name: Calathea roseopicta cv. ‘Dottie’ (its parent species is Calathea roseopicta). 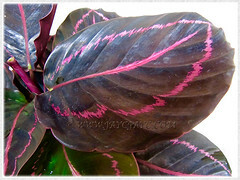 Common Name: Calathea Dottie, Rose-painted Calathea Dottie, Rose-painted Prayer Plant Dottie. 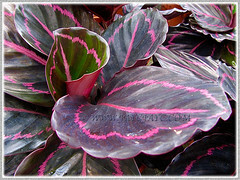 Origin: Calathea roseopicta is native to Upper Amazon in North West Brazil, tropical South America. ‘Dottie’ on the other hand is a cultivar, invented by Ann E. Lamb. Plant type: Tropical perennial ornamental plant. Features: Calathea roseo picta is a species of the genus Calathea that comprises of about 25 species and hundreds of subspecies, cultivars, varieties and hybrids that are popularly grown for their exquisitely colored and patterned foliage. The cultivar named Calathea roseopicta ‘Dottie’ is a short herbaceous and evergreen perennial that grows to about 15-30 cm tall and spread as wide. It is clump-forming, with a moderate to fast growth rate. Large orbicular leaf blades (about 12-15 cm long and 11.5-14.5 cm wide) with a mucronate and obtuse base are produced and held on short reddish-brown petioles. Leaves are glossy, with an entire and wavy margin. The leaf surfaces are coloured very dark black-green and its midrib beautifully marked with a distinctive bright pink that also encircles the leaf about 1-2 cm from the margin. 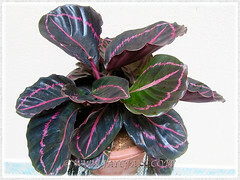 These beautiful markings remain vivid pink even as the plant matures. Newly emerged leaves are slightly lighter in colour. Leaves underside is purple. 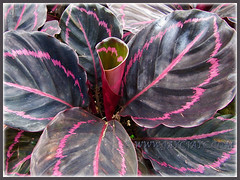 Like many species of the Marantaceae family, Rose-painted Calathea Dottie has the characteristic feature of folding up their leaves at dusk to dawn by means of the tiny geniculum, an angular knee-like joint connecting it to the petiole, resembling hands put together in prayer, hence the other common name, Prayer Plant. And, in the morning the leaves will return to normal position, that is, almost perpendicular to the petioles. The plant does occasionally produce purple and white flowers, similar to the inflorescences of its parent species, Calathea roseo picta. However, flowers are small and considered insignificant as it is greatly admired for its exquisite foliage instead. 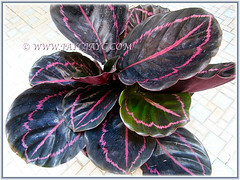 Culture (Care): Calathea roseo picta cv. Dottie grows easily with minimum care, preferring the warm, humid and wet tropical conditions. In good growing conditions, the plants will last several years. Light: Bright indirect light or filtered sunlight to partial shade for best growth and foliage coloration. Avoid direct sunlight that will scorch its foliage. It can tolerate low light or full shade but foliage colours are a tad dull. Moisture: Moderate water needs. Keep soil constantly moist but never water-logged. Overwatering can cause root rot. At lower temperatures, water sparingly and allow soil surface to dry between watering. Provide adequate humidity to prevent browning of leaf margins, by either misting the plant regularly or stand potted houseplant in a saucer of pebbles filled with water to just below the base of pot. Soil: Humus-enriched and loamy soils that can retain water, yet free draining and well aerated. Others: Remove withered or scorched leaves. Avoid drafts that can cause curling of leaves. Feed once a month with a balanced fertilizer for foliage houseplants. It likes to be pot-bound, hence repot only when pot is overcrowded or the need to propagate arises. Generally free from serious pests and diseases but mealy bugs and spider mites can be a problem occasionally. For subtropical and temperate regions: Hardiness: USDA Zone 10b – 12. 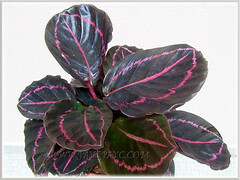 For non-hardy regions, best to grow Calathea roseopicta cv. Dottie as houseplants indoors or in a greenhouse. Provide bright, indirect light to keep the foliage colours vibrant and avoid direct sunlight to prevent scorching of the leaves. Keep them in a draft-free position, with constant, moderate to high temperatures as warmth is essential. High humidity is vital to prevent browning of the leaf margins, thus mist plants regularly or stand them on a shallow tray of pebbles and fill with water to just below the base of the pot. Water moderately when in active growth but keep them just moist in winter. Feed once monthly with a balanced liquid fertilizer for foliage houseplants except during winter. To propagate, divide the plants in late spring or early summer. Propagation: By division. Carefully separate the plants, ensuring that each division has a few plants and roots intact. Pot each division individually, locate it at a shady spot and mist regularly during the early stages to ensure success. Check how-to propagate by division here. 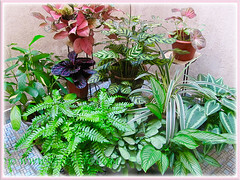 Usage: Calathea roseopicta cv. 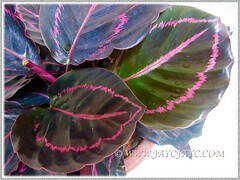 Dottie or Rose-painted Calathea Dottie makes great decorative and ornamental houseplants. 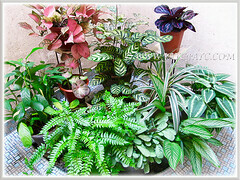 They are excellent container plants to be located at the courtyard or indoors for interior aesthetic appeal. Outdoors, grow as fillers or groundcovers in a mix border, garden bed or under shaded trees and palms to add color and variety, as well as provide a tropical scenery. They’ll look beautiful too in raised planters in the foreground with taller plants as backdrop.